There is much confusion and wishful thinking about the direction of the US economy. Supply-siders are claiming that forcing the fed funds rate below the ten-year Treasury rate will stimulate economic. (Meantime, Democrats are wishing for a recession in the belief it would guarantee them Congress and the White House). American real estate values have already lost around $1 trillion [£503 billion]. That could easily increase threefold over the next few years. This is a much bigger issue than sub-prime. We are talking trillions of dollars' worth of losses. Shiller's approach is wrong through and through. All that he has done is dress up in new clothing the fallacy that consumption drives the economy. 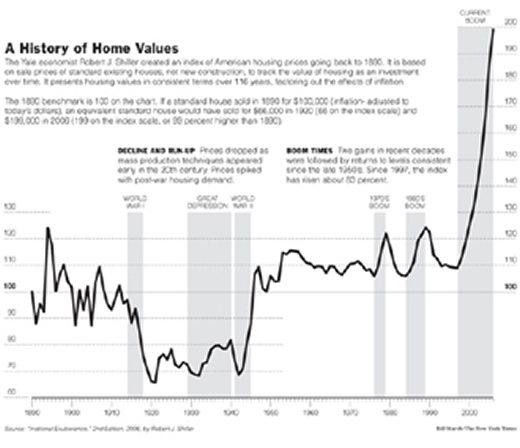 To begin with, values, as Shiller well knows, are not purchasing power. Therefore, if house prices fall that in itself is no reason for purchasing power to fall. The following chart, which comes from the second edition of Irrational Exuberance , makes my point. a classic bubble scenario. A few years ago house prices got very high, pushed up because of investor expectations. Americans have fuelled the myth that prices would never fall, that values could only go up. People believed the story. Now there is a very real chance of a big recession. Well, the answer to my question is a simple one. Keynesianism. Every housing boom has been fuelled by so-called easy money policies that involve a considerable credit expansion. Because housing is a very expensive durable consumer good* it share with durable capital goods the characteristic of being sensitive to interest rates. For example, a fall in the mortgage rate from 6 per cent to 4 per cent would normally have a disproportionate impact on the demand for housing. (Although it is only a fall of 2 per centage points it actually amounts to a 33 per cent cut in the cost of borrowing, thereby raising the prices of housing by rapidly increasing the demand for credit). The organization responsible for monetary policy in the US is the Federal Reserve. It is the Fed that generates the credit expansion. So what does Shiller give us? "Irrational exuberance". This is a non-answer to a serious monetary problem. No matter what Shiller says, you cannot spend "exuberance". Anyone who walked into a bank to demand a mortgage on the basis of an exuberant view of the housing market would quickly find himself out on the street. For the sort of misplaced optimism to arise that Shiller condemns house prices must first begin to climb. And as I have already pointed out, that would require a loose monetary policy. Moreover, a decline in real estate values cannot send an economy into recession. During the 1990s residential ‘investment' averaged about 4 per cent of GDP as against something like 5 per cent today. Now that 5 per cent comes to about 8 per cent of GDP. This is where the likes of Shiller are coming from. Take that 8 per cent and combine it with the multiplier effect one could end up with a serious drop in consumer spending, or so the reasoning goes. But what matters is not GDP but total spending — especially spending between the stages of production. It looks like the Bureau of Economic Analysis is in sympathy with this approach. Taking 2000 as an example, GDP came in at about $13 trillion while the bureau's figure for total economic output in terms of dollars came in at nearly $23 trillion, with business-to-business spending making up the difference. (My own estimate put total spending for 2000 at about $28 trillion). The BEA's approach is in keeping with the Austrian view that what matters for the economy is total spending. Fed also must undo the inverted Treasury yield curve whereby the 4.5 percent fed funds rate remains well above the 4 percent ten-year Treasury rate. (Larry Kudlow Bush Boom Continues: You can call it Goldilocks 2.0. But you can't call it a recession , NRO , 10 December 2007). It completely eludes them that monkeying around with interest rates is what caused the problem in the first place. *Capital goods are future goods. This means they are intermediate that goods that are eventually transformed into consumer goods. Put another way, the services of consumer goods are directly consumed while the services of capital goods serve consumers indirectly. According to this definition durability does not define capital goods but the position in the capital structure does. What is more, the good must be reproducible, i.e., land is not capital. Oddly enough Hayek considers houses to be capital goods “so far as they are non-permanent”. Additionally, “we have to replace them by something if we want to keep our income stream at a given level…” ( The Pure Theory of Capital , The University of Chicago Press, 1975, pp. 77-78). My criticism of Hayek's ‘durability approach' holds for De Soto's approach. The fact that my fridge is extremely durable does not make it a capital good. It's services are consumed directly by me and my wife. Did I just see Hayek, Huerta De Soto, and Mises quoted and standing in contradiction to Keynes? I think I'm going to go have a cigarette now. Well, in the US anyway it seems we are about to miss our chance, as Ron Paul came in 5th place in New Hampshire.